Few people know more about fish than Paul Johnson, whose Monterey Fish Market in San Francisco supplies seafood to some of the nation's most celebrated chefs, from Alice Waters, Thomas Keller, and Michael Mina to Todd English, Daniel Boulud, and Alain Ducasse. 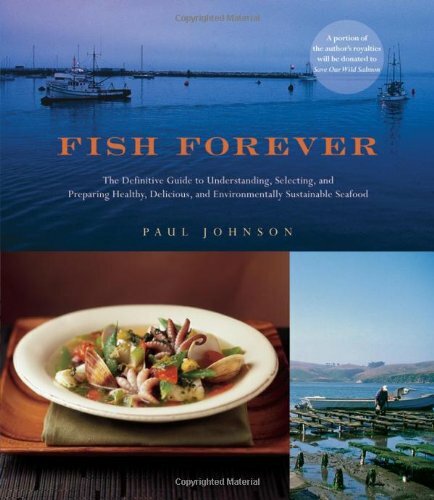 In Fish Forever, Johnson offers a cookbook for anyone who loves fish, but worries about overfishing, contaminants like mercury, and other serious health and ecological issues. Fish Forever reveals which species of fish you should and shouldn't eat, based on how endangered, contaminated, and tasty they are. Plus, Johnson includes amazing recipes from around the world that take advantage of those most abundant and delicious types of fish. Fish Forever is a must-have kitchen resource for seafood lovers—and Earth lovers—everywhere. Wow! This was delicious! We bought a few random proteins at Whole Foods - peeled and deveined shrimp (b/c the shell on was sold out) and then decided to buy some calamari too. I looked at the cookbook for some cooking guidance (takeaway: cook high and fast for 3 minutes or low and slow for 30+). It seemed we had nearly all the ingredients for this one. I made a couple substitutions. We had no Thai chiles so I used pickled jalapeños chopped (I was skeptical, but did a taste test before incorporating and it was great—although lacking texture). I had no mint and used salad mix as the base. This dish was fantastic! I also did 1/2 lb calamari, and 1 lb shrimp).